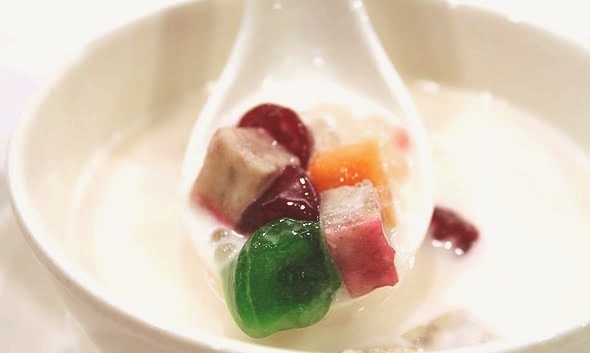 Bo-bo Cha-Cha (Bubur Cha-Cha) is a colorful dessert made of coconut milk, with steamed dainty square-shaped steamed yam, sweet potatoes (in yellow, orange and purple), tapioca flour chunks, sago and black-eyed peas. You may coat banana (Pisang Raja) with syrup before adding them into their bubur cha cha, but traditionalists would call this pengat rather than bubur cha cha. Bubur Cha-Cha is also served on the 15th day of Chinese New Year. Pandan (screwpine leaves) – a few leaves crushed and tie into a knot. Add the coconut milk, sugar, salt, and pandan leaves and simmer over low heat about 10 to 15 minutes. Don’t let the coconut milk curdle. Serve hot or cold, as you like. I prefer it cold! Very Nice Blog! Your recipes look awesome!